This page is full of additional resources to help answer more specific recycling questions. If you are looking to recycle something that cannot be put in your Blue Bin, but could be useful to someone else, visit “Recycle Beyond Your Blue Bin” to find places to recycle electronics, clothing, paint and more! If you are needing to find out your collection schedule for any waste disposal services, visit “Collection Schedule”. Looking for more recycling resources like where to take items that don’t belong in your blue bin but could have another use somewhere else? Do you already recycle all of your bottles, cans, paper and cardboard? Want to take the next step in recycling? Search our database for other recycling options. Not sure when your collection day is for recycling? Look up your collection schedule. Was your recycling collection missed? Is your dumpster or rollcart damaged? Does your alley need more recycling dumpsters? Or, do you have another problem with your waste services? Contact the Citizens’ Service Bureau to report a problem or request a service. See how much St. Louis recycles. 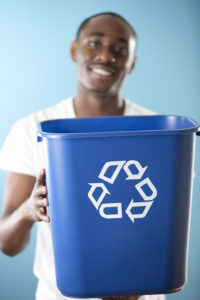 Get tools and resources to help you recycle more! Find places that sell products made from reused and recycled materials.